Whenever a Linux system CPU is occupied by a process, it is unavailable for processing other requests. Rest of pending requests must wait until the CPU is free. This becomes a bottleneck in the system. Following command will help you to identify CPU utilization, so that you can troubleshoot CPU-related performance problems on a Linux-based system. The top program provides a dynamic real-time view of a running system. 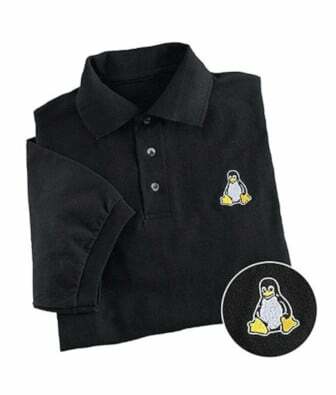 It can display system summary information as well as a list of tasks currently being managed by the Linux kernel. The top command monitors CPU utilization, process statistics, and memory utilization. The top section contains information related to overall system status – uptime, load average, process counts, CPU status, and utilization statistics for both memory and swap space. You can see Linux CPU utilization under CPU statistics. The task’s share of the elapsed CPU time since the last screen update, expressed as a percentage of total CPU time. In a true SMP environment (multiple CPUS), top will operate in number of CPUs. Please note that you need to type q key to exit the top command display. The top command produces a frequently updated list of processes. By default, the processes are ordered by percentage of CPU usage, with only the “top” CPU consumers shown. The top command shows how much processing power and memory are being used, as well as other information about the running processes. 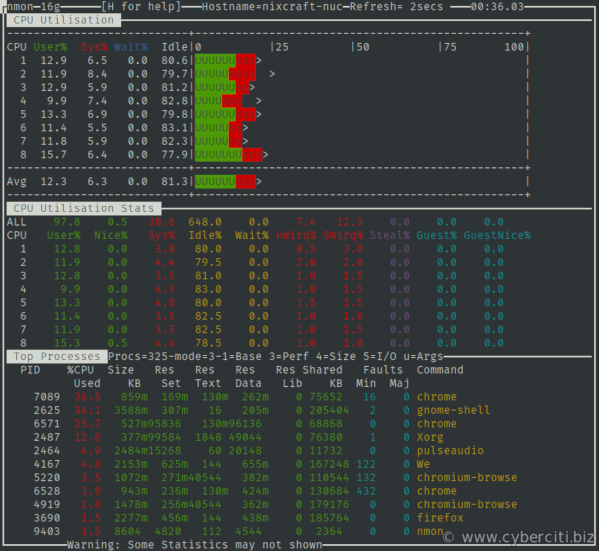 htop is similar to top command but allows you to scroll vertically and horizontally and much more. %user: Percentage of CPU utilization that occurred while executing at the user level (application). %iowait: Percentage of time that the CPU or CPUs were idle during which the system had an outstanding disk I/O request. %idle: Percentage of time that the CPU or CPUs were idle and the system did not have an outstanding disk I/O request. To get multiple samples and multiple reports set an output file for the sar command. Run the sar command as a background process using. All data is captured in binary form and saved to a file (data.file). The data can then be selectively displayed ith the sar command using the -f option. Finally, you need to determine which process is monopolizing or eating the CPUs. 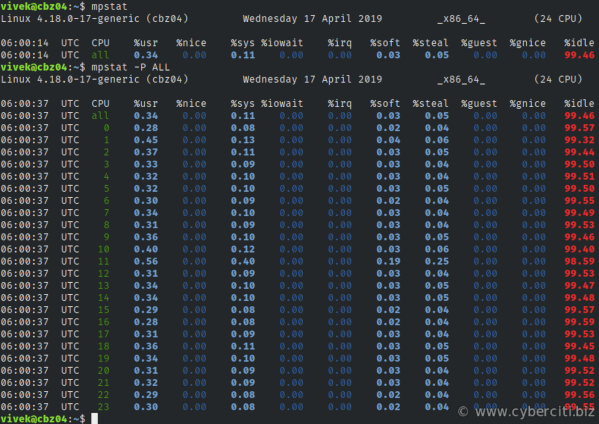 Following command will displays the top 10 CPU users on the Linux system. 96  2148 vivek    /usr/lib/vmware/bin/vmware-vmx -C /var/lib/vmware/Virtual Machines/Ubuntu 64-bit/Ubuntu 64-bit.vmx -@ ""
Now you know vmware-vmx process is eating up lots of CPU power. The ps command command displays every process (-e) with a user-defined format (-o pcpu). First field is pcpu (cpu utilization). It is sorted in reverse order to display top 10 CPU eating process. You can also use iostat command which report Central Processing Unit (CPU) statistics and input/output statistics for devices and partitions. It can be use to find out your system’s average CPU utilization since the last reboot. id : Time spent idle. wa : Time spent waiting for IO. st : Time stolen from a virtual machine. See turbostat man page for further details. Above tools/commands are quite useful on remote server. 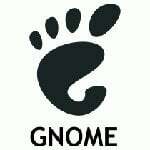 For local system with X GUI installed you can try out gnome-system-monitor. It allows you to view and control the processes running on your system. You can access detailed memory maps, send signals, and terminate the processes. For more information and command option please read man pages of the – top(1),iostat(1),mpstat(1),sar(1),ps(1) commands. So you have 4 processors shown on your dual opteron machine which means that 2 of them are virtual. How do youfilter these out when you want to see only raw info on real processor utilization? so i have 4 processors and what if only 2 are working and i still see 4 because of additional virtual processors? How do i check that? Plz answer its really important to me. I am glad – commands and help presented here helping out. MySQL is generally use more disk i/o; use iostat to get detailed information. You need to optimize mysql and also get fast SCSI hard disk. is it rt..Syntax or do we need to change any parameter. Ok, I can measure the cpu utilization… but what is the criteria to determine when a cpu is overloaded? Please let me know! Good Article. However, you neglected to mention vmstat. One of the nice things about vmstat is that it provides an insight into how the queues are filling up on each processor. 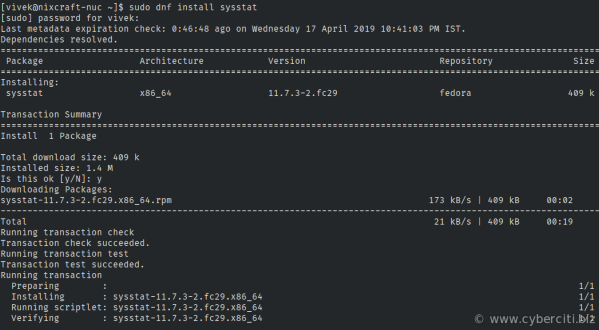 Also, vmstat comes with just about every default install of UNIX and Linux that I have ever seen, so there are no additional files which need to be installed. vmstat is also very scriptable, if you need to log the cpu usage at intervals of time. Hope that this helps. Thanks again for a good article. 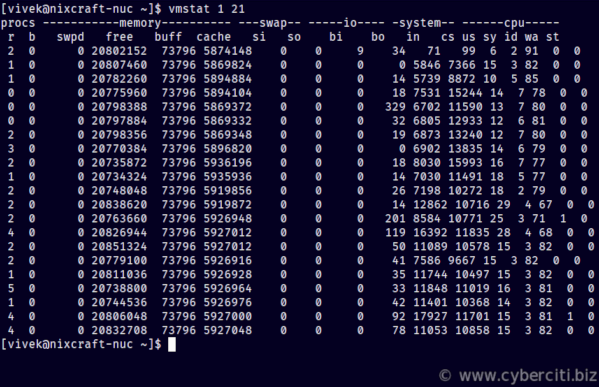 To install the sysstat package which contains (most of) the binaries listed in this article. @SpongeMucker: yup vmstat is good tool => http://www.cyberciti.biz/tips/linux-resource-utilization-to-detect-system-bottlenecks.html. I will update post with vmstat link. @ jon : thanks for pointing out fedora core issue. Appreciate all of your posts. htop works great for me. It’s a little easier on the eyes than regular old top. 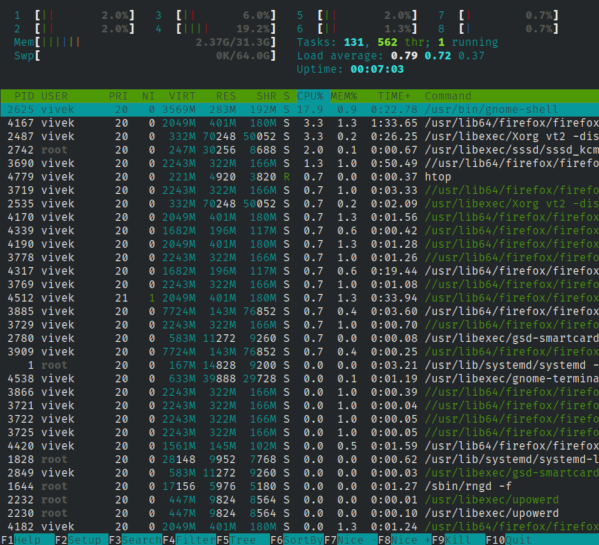 Yup, atop/htop is also useful. yes its very good explaination..
but how can one get this information like cpu usage into a program.. say C code?.. say i wanted cpu usage into my float variable.. I am not sure about C API. Thanks, htop worked great for debian sarge, mpstat didn’t worked very well. Thanks a lot it is really helpful.!! Learned a lot from this… And thank you all the readers for posting valuable comments with different commands.. this is really helpful for people like me. This is a nice and informative article. Can anyone suggest any command to monitor a process is using which cpu in SMP environment. I mean suppose I am running sshd. How do I know it is using cpu0 or cpu1 ? Thanks a lot for the post. Its really helpful. I have a following question – what is the best way to find out which process(es) was(were) using cpu(s) for certain period of time based on cpu utilization threshold? Let’s imagine that we want to find all processes triggering CPU utilization beyond 70% for more then 10 seconds during last 24 hours and dump such an information in a log with the snapshots of time of occurrence, process ID and command. Anyone has an idea how to setup such a monitoring in an elegant way? Thanks for the mpstat command! One of our server has four CPUs, but when I use mpstat or top, I can only see one CPU. In the directory /sys/devices/system/cpu, only show cpu0. But we do have 4 cpu, and OS admin told me all four cpu are runing. How do I know all four cpus are runing properly and I can use it. my server has four CPUs, but when I issue vmstat and top, I can only see one cpu. In the directory:/sys/devices/system/cpu, I can see only one cpu – cpu0. When I issue command:less /proc/interrupts, it only show one cpu. But there are do have four cpu on the server, should I do something to configure it, what should I do. Thank you for your help, I will let Linux Admin here do it. Yup, ask your admin to install Linux SMP kernel and boot into the same using Grub. Once booted using SMP, run uname -a to verify that SMP kernel loaded. Also go through /proc/cpuinfo file. The Linux Admin told me kernel-smp are package for free linux and some old version, we runing advanced linux version and do not need it, it confused me. Is it true? It is clear now, we did not install smp linux kernel, so there is only one cpu working. Could any one tell me when install Redhat linux on multip cpu server, it will automatically configure to smp kernel or have to maually select the kernel? In most cases it is installed by default but sometime installer cannot detect it and it will install normal kernel. Run yum / up2date command to install SMP kernel from RHN. It is very helpful. Thank you. i find this howto article very useful. thank you! Hi, I have a question about iostat command. How can I see the %utilization of disk not %utilization of CPU? I have found out from some of the forums and man page for iostat that the disk utilization report ought to show one parameter called %util. And also somewhere I have found a flag -D to show it but I cannot find anywhere how to configure my command so that it shows this %util field. Any help is highly appreciated. Thank you. All you have to do is pass -x option. Very useful information and very well presented! Thanks! You forgot the nicest monitoring tool of them all: gkrellm. Small, fast, nice-looking, must have. Check it out. Same question as Vitaly above. 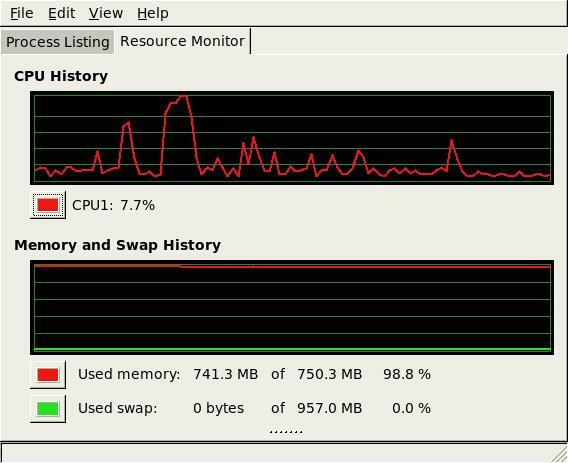 Ina 2 cpus enviroenmnt does the cpu usage percentage mean the percentage the process takes of 2 cpu or both. Please see the above exmple by Vitaly. Great intro to CPU usage. Thanks. Today is 5/28/2008 but I ran some performance tests during 5/7/2008.I need to capture the measurements for both Memory and CPU using ‘SAR’ commands for each of 1 minute interval. Is it possible? If yes, what commands should I need to use? I appreciate your input here. What do you think about cyclesoak? I wonder if you could provide some example by using it as well. Thanks for writing this, it’s a very good document about how to use proc. Excellent work. Things like this should be in the kernel docs but they just aren’t. Thanks for filling in the gaps. As from my understanding, when a core is doing stuffs, it is fully occupied, i.e. always 100%. So, is the CPU usage meaning the % use of this CPU since the last reboot? Or is it meaning the % use within a timeframe? Just to add information to my question above. For mpstat, there is a INTERVAL param. If it is set as 2 seconds, does the output mean the average % CPU usage just within that 2 seconds timeframe? This was really helpful, thanks! Is there a way to query the overall system usage say in a Perl script or something? I have a low power Linux (or XP it could be) box and want it to postpone some activity for 5 minutes if the CPU loading is say over 30%. I have a question. I am confused by “%CPU” in top. 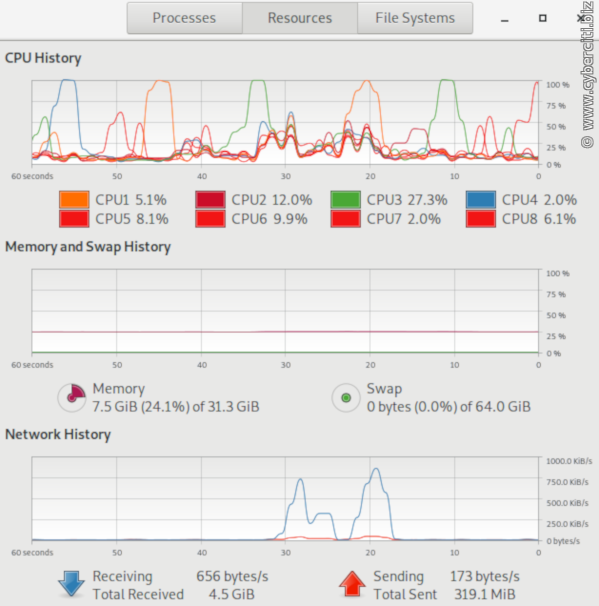 One user process used 100% CPU, but the system still have 89% idle, not 0% idle. How to understand it? It may be possible that user is using 100% CPU core or one of other CPU in multiprocessor system. that is a goos article. hope you can help me in this small issue. i have got lighttpd running and i need to develop test cases and run tests – provide dynamic content with HTML. use options like cgi, fastcgi, ajax etc. i want to monitor the resource usage of lighttpd during each test. I want to relate the CPU utilization with the energy consumed by the ststem, is there any way to do so. Or there is an alternate way to find the energy consumed by all the processes. Can anyone tell me where is this information stored? For example in unix systems at /proc/uptime gives information of uptime of the system and the value is dynamic since it would be different every time you poll. Which file stores such information for CPU utilization? So I can “cat and get the information that how much CPU has been utilized? You can try to use /proc/stat to calculate CPU utilization. To get the average system load over any given amount of time you read only the first four values into variable (for example, ill call them u1, n1, s1, and i1). Then when you’re ready you read the values again into new variables, u2, n2, s2, and i2. Now your total usage time is equal to (u2-u1) + (n2 – n1) + (s2 – s1). And your total time overall is the usage time + (i2-i1). Take (100*usage)/total and you have your percent CPU Usage. Can someone please explain me how can it be when /proc/stats shows 414% total CPU usage (including the idle time) on a quad-core single processor box? if we subtract the sets of numbers from each other, divide by 100 and sum them, we’ll find that they add up to 414.28. How can it be? 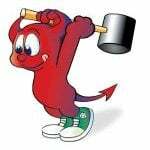 I use RHEL 5 with 2.6.28.2 kernel with dynamic ticks and multi-core scheduler support. Found it out. The bug (feature?) was in the CONFIG_NO_HZ option. I guess the kernel calculates the idle time inaccurately when the dynamic ticks are turned on. However I also have a few other 32-bit boxes (that one was 64-bit) where this issue does not occur and one 32-bit where it does. In one of my college project i require the energy consumed by the System. Is there any way to find the Power/Energy consumed by the CPU/Disk/IOs. If anyone is aware of any of such method, please reply fast, i require it urgently. I found this article really helpful, thank you, keep up the good work. This article really helped me a lot. hi hi well…. i have 1question.. ahmm….letme se…. 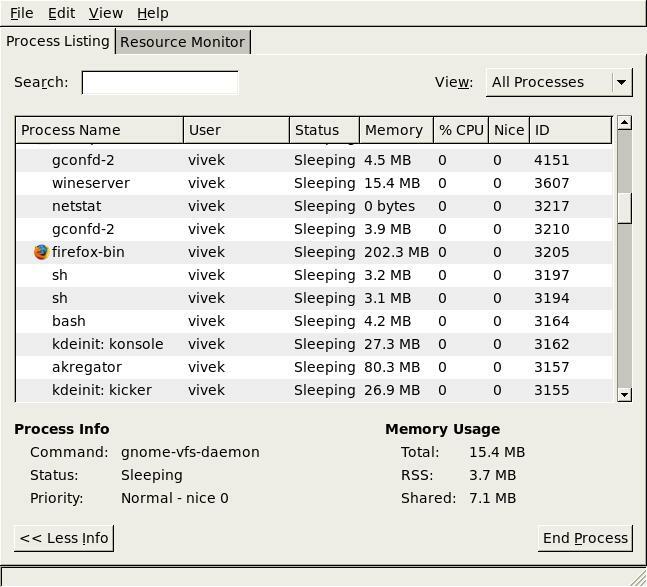 ihave a Red hat 5 linux and glassfish aplication server an’ when i try to monitoring the server i see something like …. well …. Your load average looks normal to me. 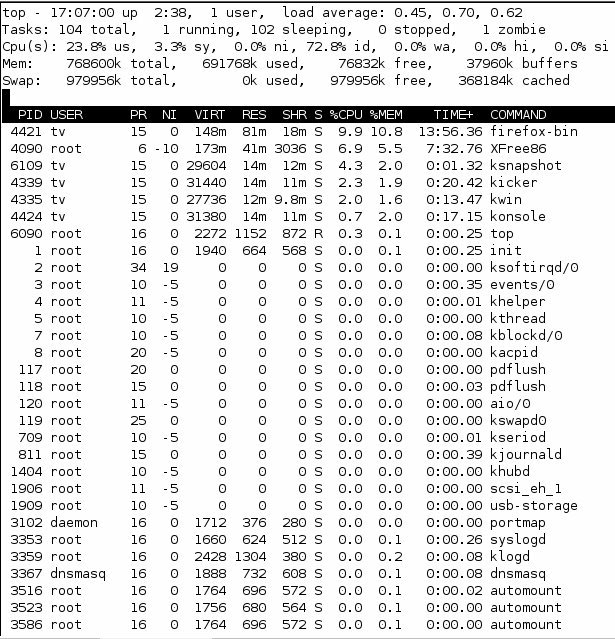 Run free -m command to see memory usage. Good info here. I like the “top|head -5” in particular – everything in one nutshell. Can someone please explain the CPU load percentage as it relates to multi-core or multi-cpu machines. If I see a load of 1.57 (157%) on a Xeon (quad processor), is that 1.57 out of a possible 4.00, or are all 4 CPUs running flat out and swapping the 57% overhead? Also, is there an easy way to get a CPU count to adjust the load statistic if needed? From the above the best I got was “cat /proc/cpuinfo|grep processor|wc -l” – but I don’t suspect it would ‘port’ from RedHat to a Sun, HP or AIX box. On a machine with 4 processors running Linux, what would a CPU load of 2 mean? While looking in an application log file, you see a line to the effect of â€œCannot bind to address: 1.2.3.4 address already in useâ€; what does this indicate? i am using this now in a monitoring script so as soon as something goes wrong i can get a snapshot of the cpu hog, and check up on process memory usage as well. How to list the top by showing the cpu core details without pressing 1. Can someone tell me how to find on which processor/core the process is attached ? I have query here. Appreciate if any one could help me on this. My server is ProLiant DL380 G3 model which is a 32 bit CPU server. It has two cpus. Now the problem is server alsways showing high IOWAIT. There is no process which is taking high CPU. All the process are looks normal. And the total cpu utilization also showing very less. Its started two month back and since then the server performance is too slow. Can any one help me on this please? I can see 16 CPU’s [0 to 15]. 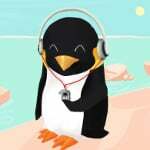 Just wanted to offer you to email me, if you are having trouble to configure/monitor your system performance on linux. 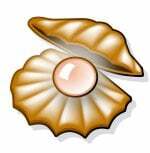 I am working as a gameserver admin, and I have been using a lot of different linux-versions, including SuSE, RedHat, Debian, Gentoo and some other Unix-like systems. As you can imagine, Realtime-Online-Gameservers are very dependent on a healthy and FAST system, where CPU,RAM & IO – Usage is extremely important, because gameservers would lag otherwise..
During the past few years, I found out a lot of tricks, read hundreds of howtos, and compiled many many different kernels with custom features for a lot of different hardware, include 32bit-single-cpus, 64bit-multicore-cpus, ppc-architecture-systems and so on and so on.. So if you have got real trouble, which you can`t easily google yourself, let me know, I`ll be happy to help out..
i have a query regarding CPU utilization and CPU percentage. What is mean by CPU percentage? Basing on what parameter we can calculate CPU percentage. On my AIX server having 4 cpu’s shows below values for each 15 min interval. and CPU percentage of all the processes not exceeded 20%. How can i understood my CPU performance from the above values. When on a multicore system, does top with no arguments show an average of each core? I know that with the â€œ1â€ argument I can see each CPU listed. But with no arguments what am I seeing? It appears to be an average of stats on each CPU? which is using two load balancer and 8 web servers. how can I monitor server performance of each machine or CPU. is it possible to get daily stats written into a log file? or do I need to get some script to do that? Is there a way to find out cpu usage per thread in Linux? Some other threads say that we cannot find cpu usage at thread level in Linux? Is that true? Any material to give more insight on this topic. 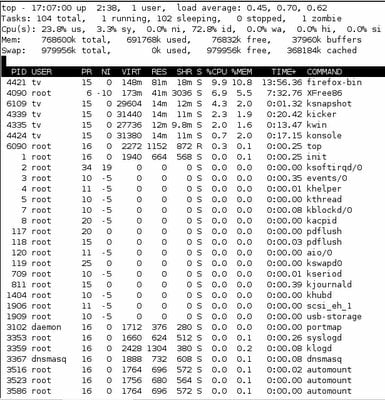 I know /proc//lpsinfo structure gives cpu usage per thread in Solaris. This gives the User CPU usage, but could be easily modified for other values. Is there anyway to determine CPU cycles currently in use and available CPU Cycles. how can i resolve this issue of CPU utilisation in my linux server. Great article.. Also please consider mentioning about vmstat tool. It is another great tool.. I am running mpstat -P ALL command and calculating the CPU utilization values. but i want to calculate the cpu utilization values of another CPU from the one that I am working from and report the values of the same to other module that is working on in my processor ..Is it possible? Please let me know ..This is a urgent requirement..
There’s no such thing as “urgent requirement” when you don’t compensate people in some way. And when you do, spelling things clearly in the first place helps a lot: having read your message twice I can’t see any impementable solution since there are too many possible interpretations. to be more specific i was using *sar and found all the data i wanted and more but realized that i needed more Graphical data. could anyone suggest which direction i need to move to get this done? Is there a way for me to see sar results for yesterday from the default log? Nice guide, very well written and documented. Will direct anyone here should any such questions arise from one of our customers. to see more info about current cpu utilization. Could you kindly descripe more detail about the below command. For example, if use command number 2 “nohup”, what directory should i used? Local directory or server directory? Thank in advance for your kind. Nice article – this helped, thanks. Nice article and equally good comments suggesting the new commands. I can see some sar files inside /var/log/sa/. I can see a block containing the CPU %user %nice %sys %iowait %irq %soft %steal %idle values. Is there some way to see memory utilization in the same file, memory utilization per process or as whole. Great post! I finally understand how to check and analyze a little better Linux CPU utilization. Many thanks! You rocks! I would guess from the numbers that sda and sdb are 1TB drives. Sine it appears to have read 1TB from sda and written it to sd, mygues is t thiis the mirrorin process. After yreboo, the nunbs shod even out.The total reads on sda and sdb should add to dm-1 and the writes should be the same. SO LETS SAY I FIND OUT WHAT IS USING ALL MY CPU AND KEEPING IT RUNNING AT 100%. I FIND OUT THAT IT IS NOT A PROCESS THAT I START UP KNOWINGLY. HOW DO I STOP IT FROM LOADING ON NEXT REBOOT? MY COMPUTER RUNS SO SLOW DUE TO THE CPU RUNNING AT 100% CONTINUALLY. I WANT TO FIX THIS. AT FIRST I THOUGH IT WAS DUE TO INSUFFICIENT MEMORY SO I REMOVED WINDOWS AND INSTALLED LINUX. I ALSO DOUBLED MY MEMORY. NOW I AM AT 512MB BUT IT STILL RUNS THE SAME AS IT DID WITH 256MB. Typing in CAPS takes more memory than not. That’s why when you hit the shift button the CPU spikes and the memory shoots up just for a second. I believe by the context of your message that you are unknowingly forcing you’re RAM and CPU to shoot up by keeping the CAPS lock button on, or rather holding SHIFT while you type. Please try reinstalling Windows and let us know your results. LOL! Wonder if he took your advice, KoSovaR. How do i store the CPU utiilization of a linux machine for a specific interval of time in a excel sheet? anyone tell me how to reduce the cpu load ? how to reduce the cpu load? i need help on top command to understand clearly, cpu utilisation.. I need to know show Linux shell script to collect CPU utilization every 5 minute and write the output in a text file. Just know that ps show CPU from since the process started, not like for example top, which show the current CPU usage status. Therefore, don’t trust “ps” in case you need your current CPU status per process ID. I am wondering why my cpu folder is empty. I got this error from my KVM, cannot open /sys/devices/system/cpu/cpu0/topology/thread_siblings: no such file or directory. 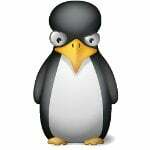 I am using CentOS (VPS from Hostgator). If wanted to find out which process took high CPU 3 days back any command available? Also MySql DB is showing 738.5% of CPU, is that a real number, if it is real what is the reason for that? Nice article about knowledge sharing. Next post: Next post: Why my Linux seems to hang at Sendmail or Httpd service screen while booting server? 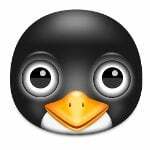 How do I find out Linux Disk utilization?